Hello Dealsnloot Readers,Scandid an app which gives you additional cashback or discount when you purchase anything on trending websites like amazon , flipkart , snapdeal etc. through Scandid . Scandid is back with a new dhamaka offer ,where they are offering Extra Rs. 48 Cashback with already listed cashback with the products for a limited period . i.e. - Rs 500 + Rs 48 Cashback for Moto g3 etc.So Grab This Loot Offer And Earn Unlimited Flipkart Gift Cards Loot. Note :- Now complete your purchase.you will get your cashback within 48 hours after product delivery. Done , Now on Home Page , look for " Beat The Heat - Be 48 Degree Cool Banner "
Click on " Grab it now "
It will redirect you to that product website . Buy Your Product And Get Cash Back On This Product. 1. "48 Degree Cool Rewards" offer is available only for the users who have done at least 1 transaction from 1 Feb 2016 to 30 April 2016 through Scandid App on any of these merchants: Flipkart, Amazon, Snapdeal, Paytm & Shopclues. 2. 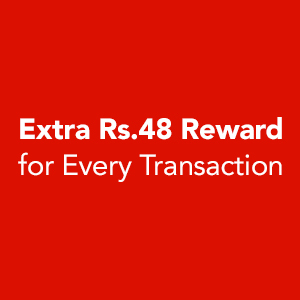 The users who are eligible for "48 Degree Cool Rewards" offer will get Rs.48 additional Scandid Rewards(Rs.48 Flipkart e-Gift Voucher) by email on Purchase of any products from "48 Degree Cool Rewards" section which is available on Scandid App. 3. "48 Degree Cool Rewards" is over and above existing Scandid Rewards. 4. This is only valid for transactions between 4th May 2016 to 31th May 2016. 5. One User Can avail maximum one "48 Degree Cool Reward" worth Rs.48 per day during the promotion period. 6. "48 Degree Cool Rewards" would be sent to user's registered email ID in 60-90 days from the date of transaction. 7. Standard Scandid Rewards Terms and Condition applies. 8. "48 Degree Cool Rewards" is available only on app version 5.8 and later. Users should update the app to receive "48 Degree Cool Rewards".